Another finish! Yay! 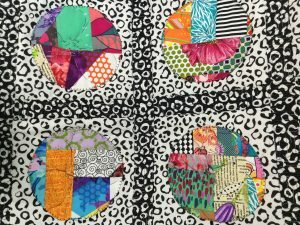 I am calling this one Crazy Circles because the circles are made from scrap fabric sewed together crazy quilt style. I appliqued them with a black buttonhole stitch on the machine. I love when I can get reverse print fabrics. 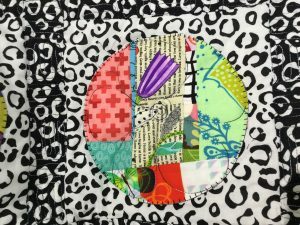 The animal print black on white is the circle background fabric and the reverse white on black is the sashing. I used both on the back. The photo on top shows a close up of the circles and the lower pic shows the quilting. I quilted a flower using a different center each time right on top of the applique and ribbon candy quilting in the sashing. 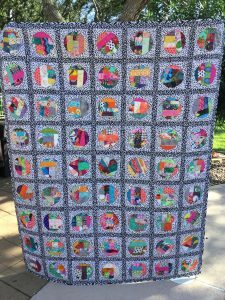 I really like this quilt and I am so glad for another finish this week.